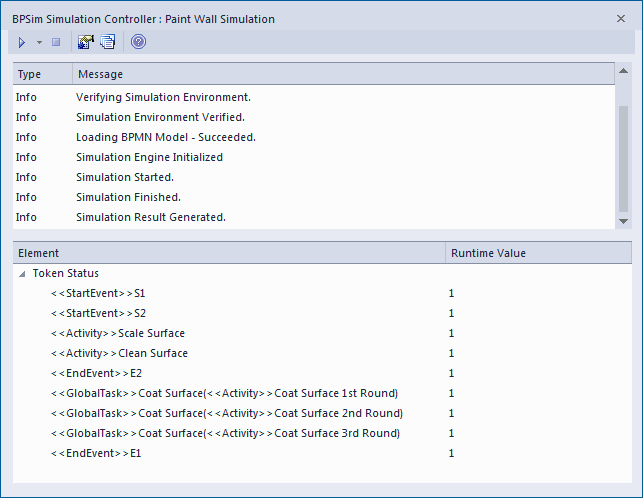 This is a simple example to simulate the process of painting a wall. We define the main process as preparing the surface and then painting it three times. Preparing the surface is further divided into tasks such as sanding and cleaning. We assume that applying each of the three coats of paint is the same process, except that the time randomly spent on each coat might be different. Tip: You can also drag the Global Task 'Coat Surface' from the Project Browser and drop it on the Call Activity element, clicking the 'set calledActivityRef' option on the context menu. 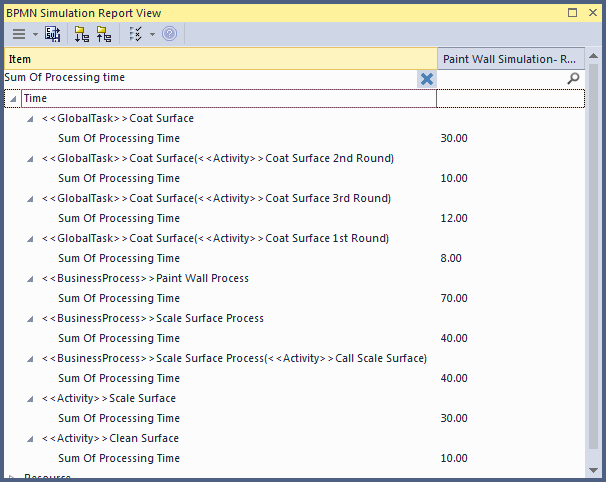 Tip: You can also drag the process 'Prepare Surface Process' from the Project Browser and drop it on the Call Activity element, clicking the 'set calledActivityRef' option on the context menu. All of the BPMN elements will be loaded in to the 'Configure BPSim' dialog. With this setting, the mean value of the random numbers generated by the Poisson distribution is 10. If you prefer, you can choose other types of distribution. Tips: Type a text string in the Filter bar to show only the records containing that text string in that column field. We can configure a 'Result Request' on BPMN elements to customize the simulation report so that we only report on the parameters we are interested in. The Flow Analysis is exactly the same as for a Standard Simulation. On the 'BPSim Simulation Controller' dialog toolbar, click on the button; the 'BPMN Simulation Report View' displays. 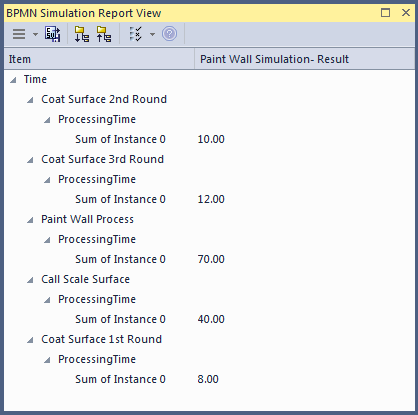 The Time Analysis is the same as for a Standard Simulation; however, the report only contains the 'sum' results we requested. Note: Currently, in the Time Analysis, we can not request ProcessingTime either on the called process itself or on the Activities contained by the called process. If you have this requirement, use the Standard Simulation.